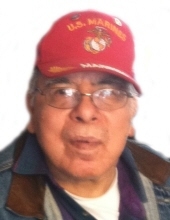 Ronald F. Webster, 76, passed away Saturday, March 23, 2019 at the Wisconsin Veteran’s Home in King. He was born August 30, 1942 in Oneida to Walter Webster and Ann (Metoxen) Spigell. Ronald served his country in the U.S. Marine Corps. and was so very proud to be a Marine. Most of his life after the service was spent as a laborer for many companies in Illinois and Wisconsin. He is survived by his brother Stanley (Loretta) Webster of Oneida, WI; sisters: Barbara Isham of Lac Courte Oreilles, WI and Joan (Kim) Daugherty of Waskum, TX; his nephews: Richard Webster, Eli Webster, Pete Webster, Lee Webster, Benny the Bum Isham, and Paul Isham; and numerous grand nieces and nephews. Ronald was preceded in death by his parents; sisters: Carol, Georgia, and Shirley; nieces: Sandy, Laurel, and Detze; nephew Danny; and brother-in-law Dale Isham. Family and friends may visit from Noon to 2:00 PM on Thursday, March 28, 2019 at the Ryan Funeral Home & Crematory, 305 N. Tenth St, De Pere, WI. Funeral service will follow at 2:00 PM with Full Military Honors. Burial will be in the Oneida Methodist Cemetery. Please visit www.ryanfh.com to send condolences to the family. To send flowers or a remembrance gift to the family of Ronald F. Webster, please visit our Tribute Store. "Email Address" would like to share the life celebration of Ronald F. Webster. Click on the "link" to go to share a favorite memory or leave a condolence message for the family.